I’m always the last person in my house to figure out my Halloween costume! 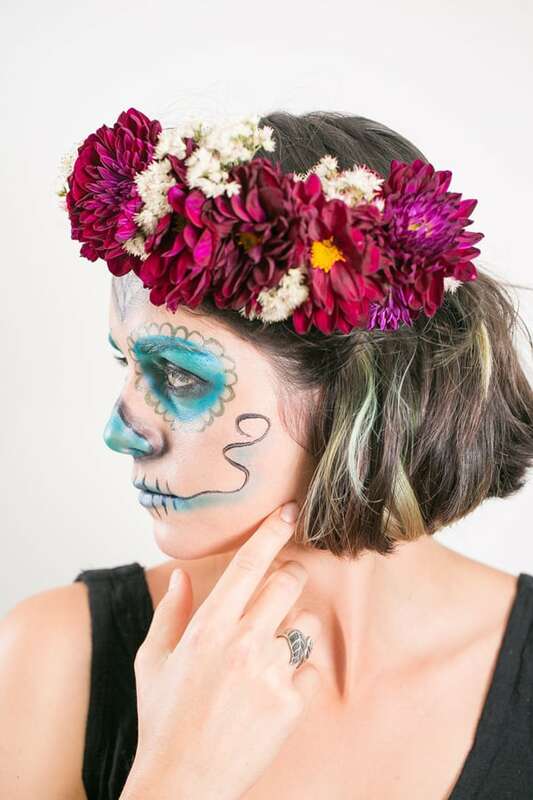 This year, Erin of White Fig Designs mentioned she had made a floral crown for a Day of The Dead-inspired makeup look. 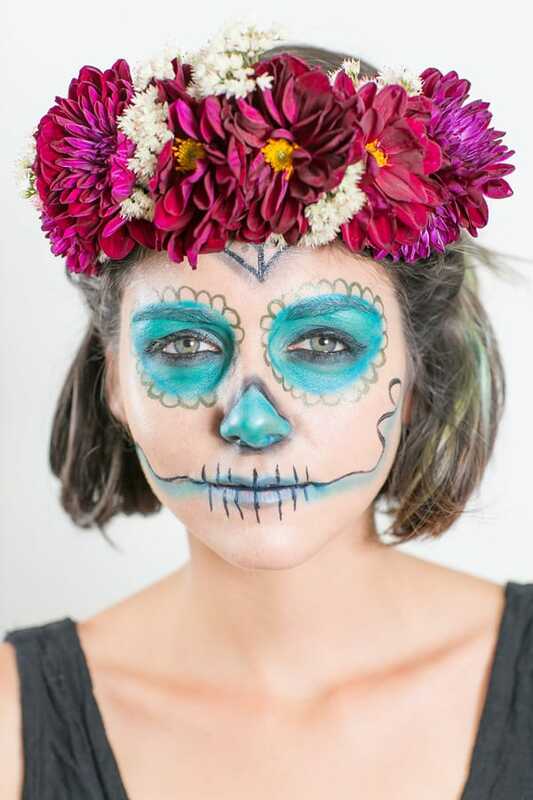 It inspired me for a Halloween party we’re going to, so I asked Erin and makeup artist Samantha Singer to share their magic with us! 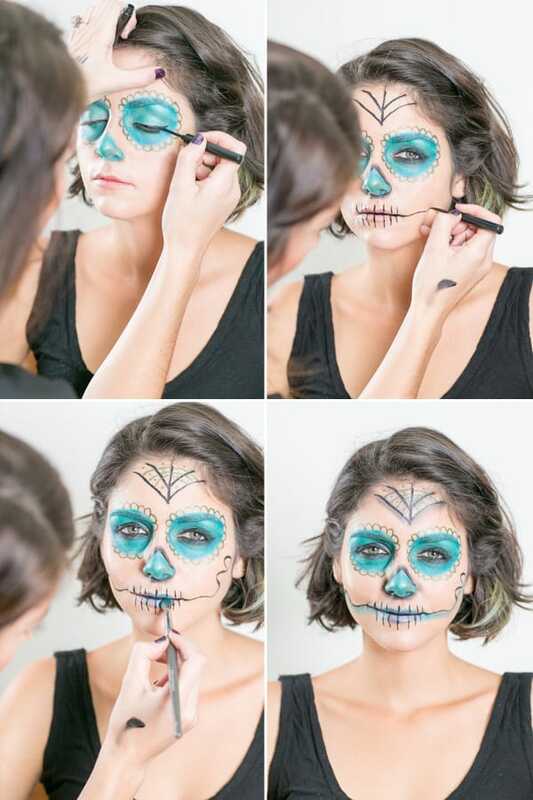 The makeup steps are for inspiration, if you have similar products, improvise and use what you have! Read more and get the how-to below! 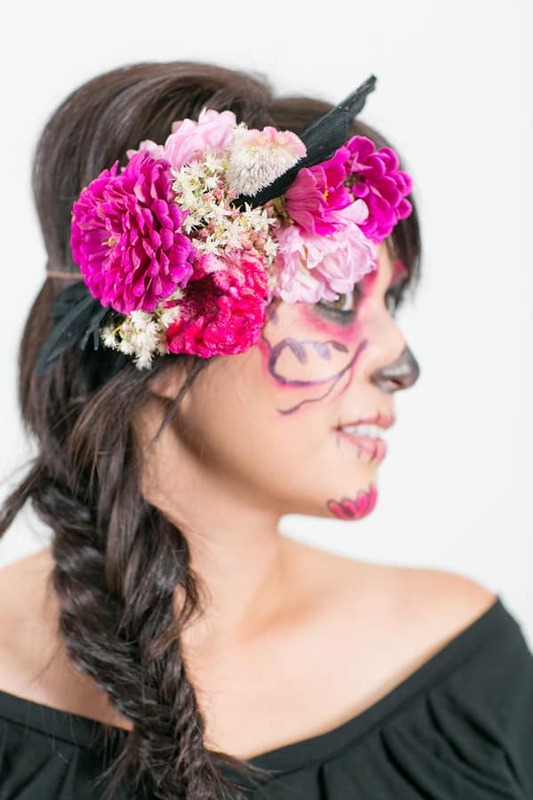 Erin is such an inspiring floral designer and I’ve worked with her on several special projects for Sugar and Charm. 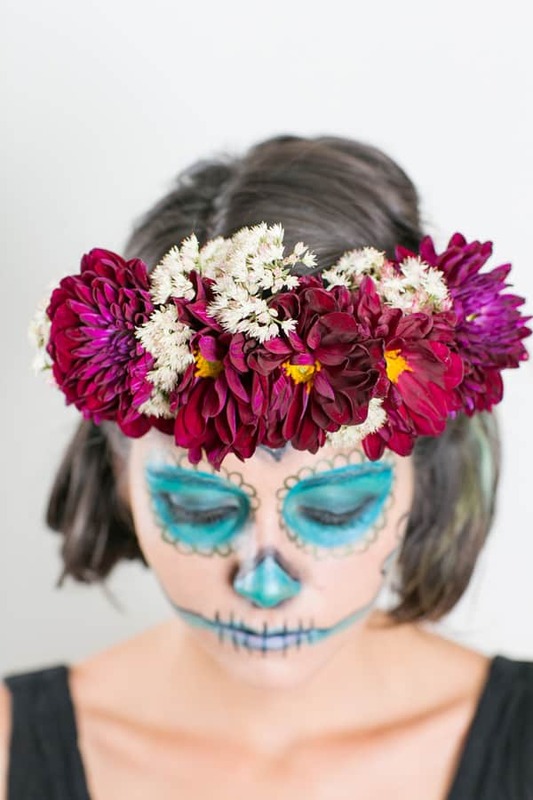 Below is her super easy way to make a fun floral crown for Halloween! 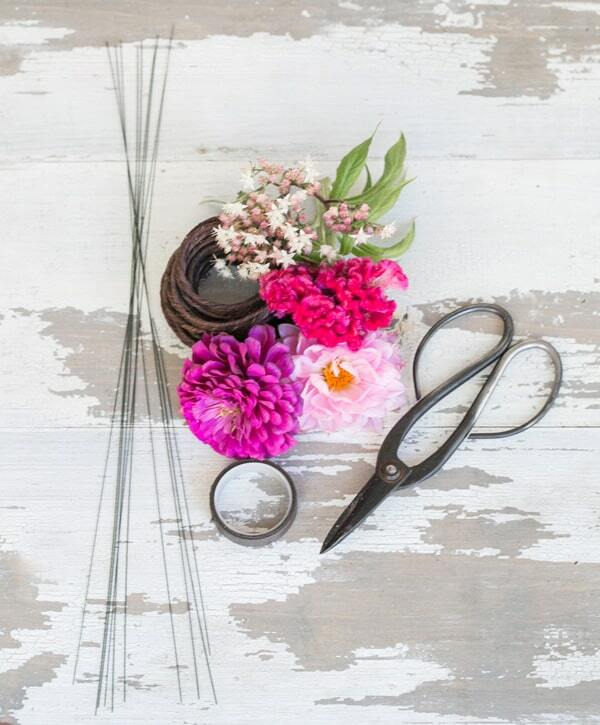 Supplies: Flowers, floral tape, floral wire, hemp wire, scissors. 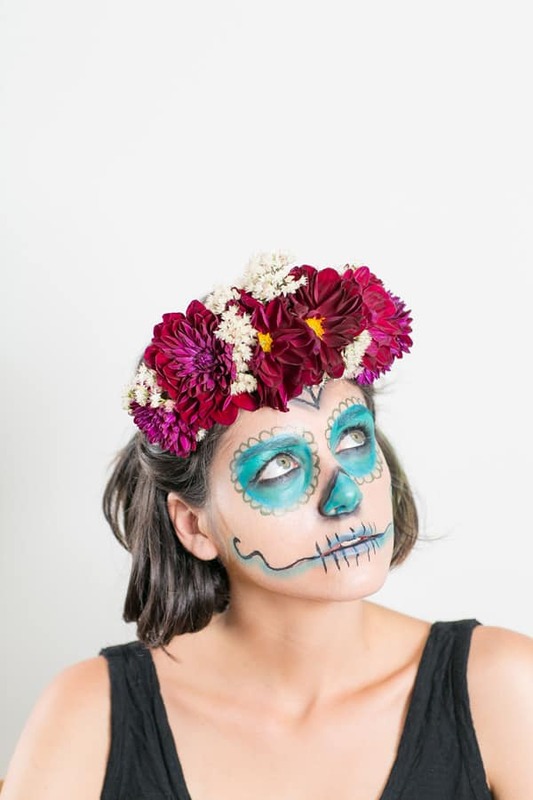 Below makeup artist Samantha Singer of Veil of Grace is sharing her tips on creating that awesome Day of The Dead makeup!! The makeup was gorgeous and I’m looking forward to trying it out on myself! Below are Samantha’s tips and some of the products she used. 7. Take black eyeshadow powder and blend around the eyeliner to make it look smokey. 8. Make a creative design around eye with Mac superslick liquid liner in green. It looks like a long skinny sharpie. You can draw with it! So much fun! 9. Continue to draw designs on the face with Mac superslick liner in black and green. Be creative! 10. Shadow in areas with the same eyeshadow color you used on the eyelid. Use the same steps for the pink tone look. Except Samantha used Ben Nye fuchsia and royal purple shadows and superslick liner in purple and black. Huge thanks to my beautiful models!